There is an almost-secret battle going on behind the scenes of the mobile platform wars; and that is the battle for mobile browser market share. What makes the battle to become the dominate browser on mobile different than on the desktop is that the battle lines are drawn predominately along device and platform boundaries. When you take a closer look at the race to become the top browsers on the iOS platform, you will find is that it is features rather than speed that users are choosing. While comScore data may show that more people are using their mobile devices than they are using their personal computers, this does not seem to apply when it comes to browsing the web. 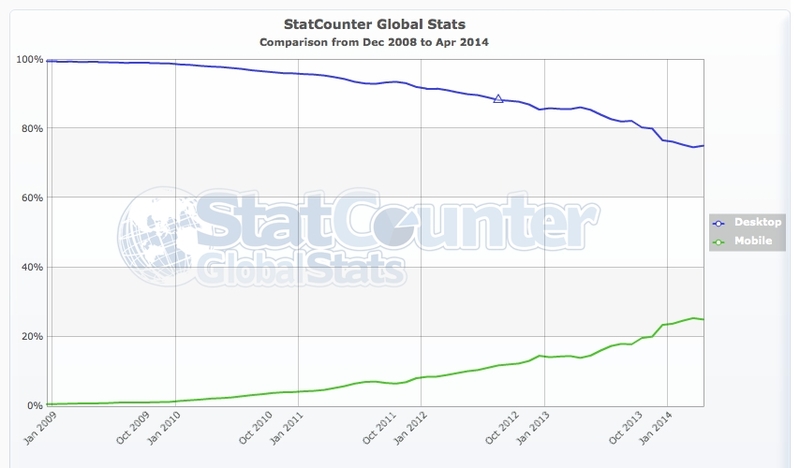 Looking at data collected from StatCounter: 24.9 percent of all web traffic is coming from mobile devices in April 2014. This is up from 13.9 percent in April 2013. While this does show that mobile browsing will likely overtake desktop browsing sometime in the future, it has not happened quite yet. Any time markets grow this fast, there will inevitably be competition and a race to the top. When it comes to mobile browser market share, the dynamics of changing market share is indicative of desktop browsers wars of the past. Looking at the top 9 mobile browsers from the last 12 months, you can see that Chrome is fast becoming the dominant browser across all of mobile, climbing from 2.29 percent in April 2013 to 13.59 percent in April 2014, overtaking Opera in the number 3 position according to StatCounter. When choosing which browser to use on iOS, the following data shows is that it can not be performance that is the driving factor. This is interesting as browser speed continues to be one of the major factors influencing which desktop browser to use. 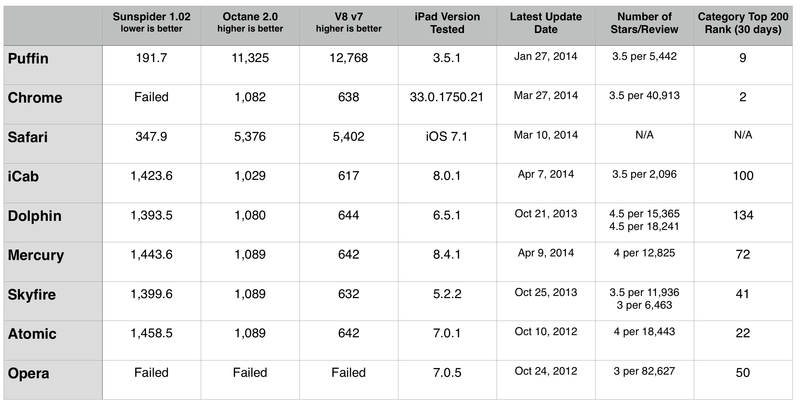 For the benchmarking tests, the iPad version of each browser was used on an 128GB iPad Air running the latest iOS 7.1 update. Three different test suites were used to test the performance of the nine different web browsers;Sunspider v1.0.2, Octane 2.0 and V8 Benchmark Suite v7. As a result almost every third-party browser tested lags behind Apple’s own Safari mobile browser where performance is concerned. The results show that each browser, including Google’s own Chrome browser, perform at nearly identical performance levels. That is, until you look at the results coming from the Puffin mobile browser for iOS. Puffin outperformed Safari in all three tests. Another notable exception was the fact that Opera was unable to complete any of the benchmark tests. Seeing as how Opera for iOS has not been updated since October of 2012, it is no wonder that it could not execute any of the latest tests. Puffin Web Browser ($3.99, Universal) has been able to achieve its wicked fast performance on iOS due to the fact that it is not running on iOS. Puffin is a browser that utilizes cloud-computing to render web pages. Not only does the cloud behind Puffin make Puffin a fast performing browser, it also allows Puffin to support Adobe Flash Player 11.9. To help users utilize flash sites that were originally built for the mouse, Puffin has a virtual gamepad when playing online games built with Flash, as well as a virtual trackpad that simulates all mouse operations like a personal computer. Puffin allows you to change your user agent setting which makes it a good browser choice when you are trying to replace your personal computer with your iPad. While it can sync your browser tabs with Chrome using your Google account, it does not sync your bookmarks or history. Google Chrome for iOS (Free, Universal) definitely has its appeal to users that are using the desktop version of Chrome, and there are a lot of users using Chrome on the desktop. Chrome is the dominant browser used on the desktop with a commanding 46.49 percent share on StatCounter. Being able to sync your history, bookmarks and tabs across all of your devices and desktop can certainly be more important than having the fastest browser. Google really has done a great job at integrating their online services into the apps that they build for iOS. Many third-party apps now support “Open in Chrome” as one of their supported sharing options. Safari Mobile (free, Universal) can sync your bookmarks, reading list, open tabs and history with all of your other devices, including Safari on OS X. What you may not know is that you can sync your bookmarks with Internet Explorer, Firefox, or Chrome on Windows using the iCloud Control Panel 3.1 for Windows. To do so you do need to create an iCloud account, but you do not have to use iCloud’s email services. In fact, you can use your any email address when creating the iCloud account that you want to sync your bookmarks with. That way you can use Safari’s fast browser on your iOS device, and any browser on your Windows desktop. iCab Mobile Web Browser ($1.99, Universal) has one unique feature that may appeal to anyone that shares their iOS device with others. It can support multiple users on the same device. With iCab you can add accounts that maintain their own preferences, profiles, and browsing history. Like Chrome, iCab has also done a great job when it comes to partnering with other third-party developers that supporting iCab as your device browser of choice. It also has enhanced support for filling lout forms online as well as uploading and downloading content from the web. Dolphin Browser (Free, iPhone Free, iPad) has extensions for Safari, Chrome and Firefox that enable you to sync history, bookmarks, passwords and open tabs on your devices and your desktop that it calls Dolphin Connect. It has its own integrated voice search, Sonar, that you activate by shaking your device. You can also use gestures to launch your favorite URLs. If there happens to be another Dolphin user near by, you can quickly share a link with them using the WiFi broadcast feature. When it comes to creating a rich set of unique and innovative browsing experience, Dolphin has really outdone itself. You want a real browser on a smart phone you have to move over to Blackberry OS 10 which has been leading in speed and HTML 5.0 comparability every since the Blackberry QNX based OS came out. Till just recently the best tablet browser was still on the two year old Blackberry Playbook tablet. I’m not making this stuff up and you also get Flash support. I am Shioupyn Shen, CEO of CloudMosa, maker of the Puffin Web Browser. I am very pleased to see a report on the “secret battle for mobile browser”. On smart-phones, many popular browsers are bundled through distribution channels, and their higher market shares are not necessarily due to users’ explicit choice. On tablets, the browsers are barely bundled and the market share is dramatically different. 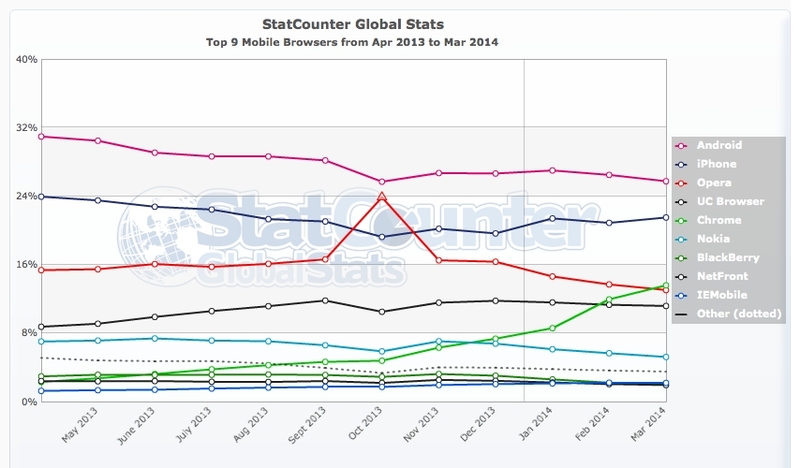 StatCounter also provides the usage share data on “tablet browser”. You should take a look there. For world-wide usage share on tablets, Puffin is only behind Opera, Firefox, and the built-in browsers (which have the dominant market share due to bundling). Puffin is doing very well if users are the ones who make the decisions on their browser choices. “There are only two kinds of people in the Wild West, the quick and the dead.” Mobile is just like the Wild West. It can be a fatal mistake to overlook the importance of speed. I don’t think most people buy a phone because of tech specs. No, most people don’t feel that way about gigabits and cores and threads and the like. That said, as long as a browser is fast enough, it’s fast. What I find is that I hate many of the sites I go to on mobile. HuffPo, for instance, has so many ads and banners and stories and links on each page that items and pages and ads are reloading constantly on a fast machine. Technically you got the whole page in a few seconds. But then, more junk loads, causing the reloading of the page Then the video from another source comes up, and redraw again. This is JUNK. Look, I realize that the online press doesn’t like ad blockers. But your article is incomplete without mentioning them. For me *the* one most important reason I’m not using Safari on my iPad is its lack of an ad blocker. On the desktop, no problem. Safari for OS X supports all the popular ad blockers and privacy enhancements. On iOS I have to rely on a third party browser (iCab in my case). Without an ad blocker, most of the web is almost unusable for me. Obviously I did not list that particular feature, but it was not intentional. Honestly, I typically do turn off ads in any browser I am using by habit. And not having that feature in Safari on my iPad never really bothered. Not until you mentioned it just now. Not like iOS users actually have a choice in terms of performance. Remember you can’t directly compete with Apple’s browser. You have to use their slower “embedded browser” if you want to make a “new” browser for iOS. Author, this is an advertorial for Puffin? True, I was impressed by the speed of puffin. I had to run and re-run my tests just to be sure the results were true. I also feel that some of the other browsers in this roundup have some solid features not found in puffin. Giving up syncing bookmarks, reading lists and history across all devices may not be worth the speed gained by using Puffin. That being said, it is pretty fast. Google spyware browser never at any speed or feature. You say that Chrome is starting to become dominant on mobile. Well, if you look more carefully at the user agent strings, you actually see a different picture. This is because the default browsers for Samsung/LG smartphones etc., are increasingly being reported as Chrome when they are not. Looking at NetMarketShare, which also reports browser usage stats, you see that about half of Chrome usage is by older versions. These can’t be Chrome because it auto-updates. These are Samsung/LG etc. default browsers. Truth is that only about 1/4 – 1/5 of Android users are using the genuine Chrome browser.